No wonder the head Wilde-man at the University of Windsor took little action on Frat parties. I wonder if he is crying in his beer after the latest Macleans rankings. The President of the University of Windsor Student Alliance is questioning a new staff entertainment policy approved by the School's board of governors. The policy states that alcohol may be purchased while entertaining people like donors, guests and volunteers. Mohsin Khan says some students won't like seeing their tuition spent on booze for others. Board Chair Dave Cook says alcohol is just part of promoting and selling the school." Oh how nasty people are east of us on the 401. Take a look at this story that should make it impossible for anyone to want to move or invest here in the foreseeable future. London firefighters have agreed to extend a just-signed contract for another year. News of the deal's extension comes just as Windsor is reportedly set to lay off firefighters as city officials there mull a slew of significant spending cuts. Windsor Mayor Eddie Francis told reporters late last week 12 positions at the fire department, including five firefighters and four captains, are being cut. While the London union is aware of what's happening 200 kilometres down Hwy. 401, Holmes says he doesn't expect the city to ever take such a step. "It's happened in a lot of American cities that are going through an incredible budget crunch, but Windsor is quite the exception" in Canada, Holmes [president of the firefighters union] said. "As bad as things are here in London, they're way, way worse . . . there." "David Bradley, CEO of the Canadian Trucking Alliance continues to tell North American trade groups that the continued decline in cross-border truck movements is “masking” problems at the border and imposing significant costs on the North American supply chain. This past week Bradley was part of a panel at the Border Trade Alliance conference in Buffalo, NY and keynote speaker at the Ports-to-Plains/Texas DOT conference in Lubbock, TX. Bradley told both groups that as of August, on a year-to-date basis, the number of trucks crossing the ON-US border were down 18% and are now at their lowest level since 1996. “After 6 straight years of growth between 1995-2001 when the numbers of trucks crossing the border jumped 38%, by the end of 2009, the number of trucks crossing the border will have dropped 5 years in a row and will be 22% of their 2000 peak,” he said. Interesting, nothing about building a DRIC Bridge. At a cost of billions, it is certainly not modest and without any traffic, it is certinly not meaningful. With regard to the border, Bradley said that governments on both sides of the border are calling for a new border framework. "They are urging us to develop the next great idea, to think outside the box," he said. "That is fine, but most of us are living in the day, trying to survive not only the challenge to improve security, but also to keep our companies whole, to serve our customers and to operate in a safe and environmentally-friendly way." Yup, why spend taxpayer billions when traffic is dying when the Bridge Company is prepared to use their money and take the risk. How were they short-listed? What were the criteria used? For years, Australia's biggest investment bank has been raising billions for airports, tunnels and toll roads throughout North America, Europe and Asia. Now the Sydney-based bank Macquarie Group Ltd. is seeking to help finance construction of a new Midtown Tunnel, upgrade the Downtown Tunnel between Norfolk and Portsmouth and extend the Martin Luther King Freeway. Macquarie and its construction-company partner Skanska formed a joint venture called Elizabeth River Crossings, which is negotiating with the Virginia Department of Transportation to finance, build and operate the $1.5 billion project. An interim agreement with VDOT is scheduled to be in place next month. In presentations to government officials and an independent review panel, Elizabeth River Crossings called attention to Macquarie's success at raising more than $8 billion in recent years for toll-road projects in the United States. But financial markets have been jolted during the past year by heavy losses and investors' aversion to risk. That's likely to make the job of raising money for the tunnel-and-expressway project more complicated. "The folks providing debt are being far more cautious," said Michael Garvin, a civil engineer and associate professor at Virginia Tech who has studied construction projects by public-private partnerships. Lining up financial commitments "is going to be a challenge for at least a couple of more years." The schedule for the tunnel-and-expressway project calls for Elizabeth River Crossings to have a comprehensive agreement with VDOT by early 2011 and to close on financing that spring. In an evaluation of the Skanska-Macquarie proposal, VDOT determined earlier this year that the two companies are financially qualified and capable of lining up the money to build and maintain the project. But because of uncertainty in financial markets, the report said, "Macquarie's ability and willingness to provide a significant direct investment in the project should be monitored," said the report, issued May 13. Macquarie, it noted, was initially engaged as a partner in two recent toll-road projects - one in Florida and another in British Columbia - but later withdrew. "Overall, it is a strong company," said Deborah Brown, VDOT's innovative finance officer and co-author of the report with the department's chief financial officer. Given the environment for financing these types of projects, "we still felt it was wise to continue to monitor their condition." Paula Chirhart, a Macquarie spokeswoman, noted that the company continued to serve as financial adviser for the Florida and British Columbia projects and remains active in financing infrastructure projects. "The partners in Elizabeth River Crossings are absolutely committed" to the one proposed for Norfolk and Portsmouth, Chirhart said. The Councillor has to be furious. When Jo-Anne Gignac went to England last Tuesday, she did more than just take in the sights. She invited the Queen to Windsor. Gignac is excited about the invitation. "I know the people of Windsor will be thrilled," she said." But I, like many in my generation, don't see the point of Canada's constitutional monarchy. With Prince Charles, the heir to the throne, and his wife Camilla, the Duchess of Cornwall, visiting for 11 days, now is the time to make that point. As former Newfoundland premier and federal cabinet minister Brian Tobin said, it's silly that someone from another country is our head of state. We're not a good match anymore, either. England remains a fundamental and inextricable part of our history, but Canada is no longer a British colony. We're a sovereign and multicultural country, and we do things differently." I almost blew a fuse. A truly electrifying event in Windsor. No strike at Enwin! Watts going on here? Heck, there wasn't one at WUC either. Watt gives? Seventy-five outside workers at Enwin Utilities have voted 83 per cent in favour of a new 3 1/2-year collective agreement. The workers, represented by the International Brotherhood of Electrical Workers Local 636 Unit 21, will receive a 6.5 per cent increase over the life of the agreement." So then please explain to me why we needed a 101 day strike of CUPE workers to achieve a similar resolution. I would get a charge out of seeing the Minutes of both WUC and Enwin to see how Mayor Edgar (aka Eddie) voted since he is on the Board of both. I wonder if there was a spark of independence from the other Board members to approve the contracts. Depending on what Junior amplifies about the CUPE strike in his Report upcoming on November 10 at the Ward 4 Councillors meeting, it may impact the next municipal electron-ion. I am positive about that! posted by JoeBlog at 8:00 a.m.
You are the Premier of a have-not Province that used to be the richest one in Canada. Your deficit has grown to the multi-multi billions, so much so that your Minister of Finance can barely mention the number without choking. However, somehow you have found a spare $1.5B to play with. You could use it to build the most expensive road in Ontario's history in Windsor, an area where the sitting MPP/Cabinet Ministers are virtually unbeatable and the small-town Mayor does not know his place and keeps on attacking you. OR you could use the money for children across the Province including ridings where sitting members are at risk and in Opposition ridings where you could take a seat or two. Moreover, there are going to be some nasty election issues that are coming up and you do need some good news. What to do with it? What to do? Kids or DRIC. DRIC or kids. But with full-day kindergarten, the initiative at the heart of the early learning plan, Mr. McGuinty has found his sweet spot - a policy that he desperately wants to be remembered for, and one that future governments will find very difficult to make Ontarians forget. "It's not the only test," Mr. McGuinty said in an interview last month. "But one important test of public policy is, do I think that anybody would seek to undo this. I find it hard to see somebody seeking to undo this..."
For a projected annual cost of $1.5-billion, then, Mr. McGuinty has acquired a legacy. And because nobody wants their legacy to be half-assed, he has gone further than expected in adopting Dr. Pascal's recommendations - notably fee-based before- and after-school programs not just for kindergarten students, but (where demand warrants) for older children as well. After months of hints that the Liberals would stick fairly rigidly to their previous campaign commitment, which was just all-day kindergarten, some schools are going to look quite a bit like the community hubs Dr. Pascal envisioned. Premier Dalton McGuinty will announce Tuesday that it will take Ontario five years to phase in a much-touted plan to offer all-day kindergarten for all four- and five-year-olds, The Canadian Press has learned. The logistics of the scheme are almost overwhelming. But Mr. Pascal said he's feeling “very positive” that Tuesday's announcement will mark a new beginning for the province. “This is absolutely critical for the social and economic progress of our province,” he said in an interview. If you compare all-day kindergarten to other stimulus ventures like bridge-building and road repairs, the investment in children is the project that “keeps on giving,” he said. With early learning, children are better prepared for elementary school and parents seeking supports for their kids are no longer navigating a “fragmented” system, he said. “There is no better return on a taxpayer's investment than early learning in terms of our future progress,” Mr. Pascal added. All-day kindergarten should be a priority for the Ontario Liberals because it would create a foundation for other positive changes in education, said Annie Kidder of People for Education. “Economically, it does makes sense, even though we're in a recession,” she added. Many of you covered the flap a couple of weeks ago over the release of the 2007 inspection report for the Ambassador Bridge. 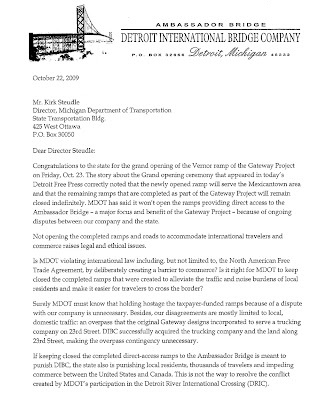 I hope we were clear that The Detroit International Bridge Co. was not so concerned about anything the report said about the bridge’s condition itself as we were about trying to uphold a written confidentiality agreement with the government. Nevertheless, in the interest of openness, we are making available to you the 2008 inspection report. It will be available shortly, hopefully within the next 15 minutes, at www.ambassadorbridge.com/2008inspection. There is no mystery to the release time; we just received an electronic copy of the report at 11 a.m. today and it’s taken a little time to put together the Web page. Some of you have seen the 2008 report already. Those of you who saw the 2007 report provided through Congressman Dingell’s office will not see anything strikingly different in the 2008 report. Everything identified for maintenance or repair in both the 2007 and 2008 reports has been addressed in some way. Some items have been fixed, others are ongoing because some projects take longer to complete and some items such as the bridge deck replacement are being engineered. Some items are handled in-house and others by contractors. The 2008 inspection report actually was made public in July when we shared it and discussed it in detail in meetings with regulators from the Michigan Department of Transportation, Federal Highway Administration and Transport Canada. That is how we are supposed to be open to the public – by sharing this information with the professional regulators who are responsible for representing the public in such technical matters. Those regulators all say our inspections are extremely thorough and they all agree the Ambassador Bridge is safe for the public. The 2009 inspection is under way. That report will not be published until mid-2010. We understand if you don’t want to do a story about the 2008 report so soon after such thorough coverage of the 2007 inspection, especially if the findings are the same. But feel free to contact me if you have any questions. Meanwhile, I wonder whether you could get the same inspection detail about the Blue Water Bridge, International Bridge or the Mackinac Bridge. I assume that the Tunnel has inspections undertaken periodically about its condition, especially its safety since it is used by the public. Would you please provide me with a copy of the last inspection report undertaken. After all, thousands of individuals and truckers use the Tunnel every day and I believe they are entitled to know the state of the Tunnel before doing so especially since it is owned ultimately by the City. If possible, please send it in electronic form so that I may distribute it in the public interest on my BLOG. Is there a politician around in Canada or the US who will finally stand up and demand that DRIC be killed before more millions are wasted at a time when our economy needs every penny? Why are they so afraid to do the obvious? I am sorry but I am going to sound somewhat "shrill" in this BLOG. Bear with me please and you will understand. You truly will NOT believe what I will tell you. You will shake your head in amazement and think that I am making all of this up. You will not be able to blame me after reading this BLOG. 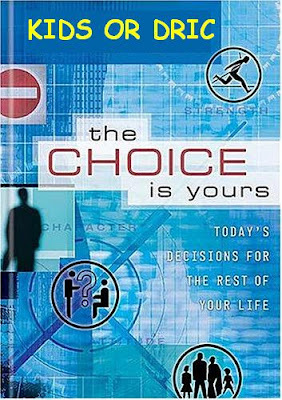 In fact, I think many of you will have no choice but to join me as you see money being taken from your wallets right in front of your eyes. Read on, dear reader, read on. Does no one in Government or the Bureaucracy or their consultants have any shame? Do they have to beat Matty Moroun so badly that they cannot stop no matter how much it costs taxpayers. We are in a near-Depression for God's sake, doesn't anyone care? I am so sick of our decision-makers wasting so much of my money that I cannot stomach it any more. And this is just ONE project! Imagine the waste in governments across North America. The Auditor-General of Canada merely scratches at the surface of lack of any accountability whatsoever in her Reports. "Moroun will lose some traffic, but there's more than enough business to go around." Where is there more traffic? He can read the numbers as well as you and I can. Is he so insulated from the real world in Ottawa? Did he fail math at school? Click on each of the graphs above and look at the numbers for yourself. If Ohio actually builds their own Casinos in Columbus, Cleveland, Cincinnati and Toledo as they just approved in a vote, we may have no auto traffic at all! Car traffic numbers have dropped at the Bridge and Tunnel by almost 50% since 1999. Truck traffic has been steadier but showed virtually no growth. Then in 2008 and 2009, the bottom dropped out with the collapse of the auto industry in the region and the manufacturing decline. How is it ever going to come back and when? DRIC projections have not been right so far. What makes anyone think that will change! Now you understand why DRIC consultants had to cannibalize traffic from all of the other crossings in order to try and pretend that the DRIC Bridge could pay for itself with tolls from users while at the same time Transport Canada was telling the Senate that they had no intention of hurting the Bridge Company. The Ambassador Gateway project itself can handle almost double the number of trucks crossing the border today WITHOUT the need for another bridge. No one can finance a multi-billion dollar DRIC project from user tolls with these kinds of numbers UNLESS there will be a huge Government subsidy or guarantee along the lines of what Infrastructure Ontaruio is proposing for the DRIC Raod. What's the big deal, right? 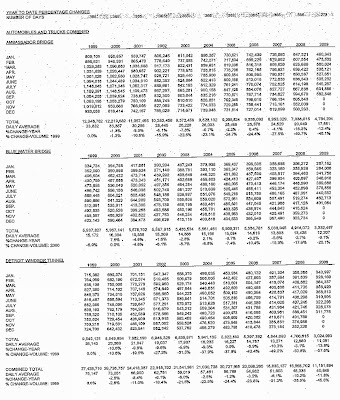 I have written about this ad nauseum before except without such dramatic tables. BUT there is more. "(2) The department shall submit an investment grade traffic study to the legislature by May 1, 2010 from a reputable traffic company with appropriate experience intended to provide a detailed traffic projection for the ensuing 10 years, taking into account projected infrastructure modifications, expansions and improvements announced." The Michigan Department of Transportation has received approval to sign a $257,000 contract with the Lansing office of South Carolina-based transportation planners Wilbur Smith Associates Inc. to conduct a traffic and toll study for a proposed Detroit River crossing in Detroit. The study, whose contract was approved today by the State Administrative Board, will provide MDOT with traffic and toll-based revenue projections for the Detroit River International Crossing project, which would build a publicly owned span between Detroit’s Delray neighborhood and Windsor’s Brighton Beach area in the next few years." I just could not believe it.....a quarter of a million dollars for this! Why is Michigan paying a cent? Why didn't Canada just give them their reports? AFTER ALL, WILBUR SMITH PREPARED THEM!!! Who was one of the signatories to the DRIC Advocacy Ad. Yup, that WILBUR SMITH! Reasonable apprehension of bias! I wonder what the Report that will be prepared by a Canadian Govenment consultant who also is strongly in favour of building DRIC will say about traffic volumes! That is also the consultant writing the environmental impact statements for both the Blue Water Bridge and Peace Bridge plazas, sites that compete with the Bridge Company. DUHHHHHHHHHHHHH!!! Honestly, I can no longer believe anything about this project. It is so mind-blowing how it is being played by Governments to justify what they want to do. How can the Governments be taken seriously any more. I will be sending a summary of some of the stupidity of this file to Professor Professor Bent Flyvbjerg who wrote the book "Megaprojects and Risk: An Anatomy of Ambition"
"Megaprojects and Risk: An Anatomy of Ambition provides a fascinating look at the pervasiveness of misinformation in the planning of major construction projects and the systematic bias of such misinformation towards justifying project implementation." The DRIC fiasco deserves a separate chapter in any revised Edition of his work. I promise you, even he will not believe what I shall bring to his attention! 1) "As the Michigan Department of Transportation celebrates the opening of the new I-75 Vernor ramp, major features of the Gateway Project remain closed. Direct access to the Ambassador Bridge from I-75 still isn’t a reality, even though the ramps have been completed for months. 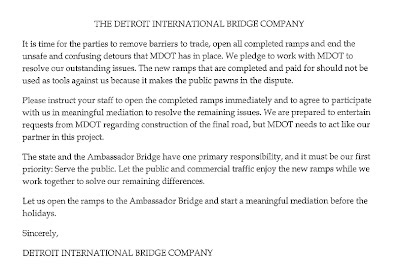 Please see the attached letter from the Detroit International Bridge Company to M-DOT requesting the opening of the ramps, for the good of the public, while we work on an agreement for our remaining differences. 2) This story (Ottawa's refusal to take Gitmo inmates irks U.S.) doesn't look like it is bridge related DRIC or otherwise but you don't snub the US on one thing and hope to get something else! The City of Windsor has not yet received any "legal opinions"
lawyer has simply presented arguments in favour of secrecy. of the operations of the municipality,...."
for money in municipal operations." duties as may be assigned to him or her the the municipality..."
under this part; or (b) under the Criminal Code. anything done under this part." 27.1(1), (2) and (3) of the Ontario Auditor General Act. KPMG report secret without blaming the Municipal Act? Stay tuned. 4) I Just read..........The Windsor Canal Project Business Case....what a pile of horse****!.....Do people actually believe this? 5) Of course, children are getting the short end in Michigan too. To balance this year’s budget, the state slashed aid to school districts by $296 per pupil, virtually guaranteeing greater class sizes, teacher layoffs and whole districts going bankrupt. Also, I saw on the Huffington Post an AP story about the counties hardest hit by the recession. While California and Nevada counties dominate the list, it is still sobering to note that four of the top 20 hardest-hit counties are in Southeast Michigan: Wayne (10th), Lapeer (11th), St. Clair (12th) and Macomb (16th). Meanwhile, Michigan cuts revenue sharing to counties and local governments by 11 percent in the new budget. We can build a bridge, but we can’t support police and fire protection or maintain local services when they’re needed most. some of The Supply ECE's have not been called back since most of the city childcare centres do have their numbers back up. if they are not called back after our 1 month break in service? 7) Mr. Moroun is going to hold these clowns hostage. Edgar's arrogance to the Bridge Corporation will go down in history as the greatest mistake a Mayor could make. Stupid fool for messing with The Man. 8) MIKE DUNBAR FOR MAYOR!!!! 11) Would be interesting to know more about that "proposed water & waste water project" mentioned in the announcement. Surely sewage treatment comes into play. One of the Councillors has been tattling about property tax increases being placed outside of city hall through our enwin bills' sewer surcharges and then back into city hall through the "dividends". He probably knows more than he lets on. 12) Thanks for publishing those first two very important articles: A Reader's Swine Flu Idea and Aviva Community Fund Competition. Regarding the vaccine, we just printed up a schedule of community sites for vaccination, at our office. Funny, I was at my doctor's office last week; he said he only had the shots for seniors, healthcare providers, etc. I said no problem. I heard on a radio show that someone polled the general public and only about 40% want to be vaccinated. That's surprising. It will be those 60% of people who will spread the virus around. Regarding the play on Bipolar Disorder, a friend and I are conducting seminars on Bipolar Disorder around Ontario, so I was quick to lend a vote. what i do know ... and know to my basic instinct ... is that HOW all that is transpiring is WRONG ... wrong for what it is turning people into (hateful enemies of each other) and wrong for what it is doing to our community (taking away our sense of community) ... it is unChristian to inspire this in mankind. 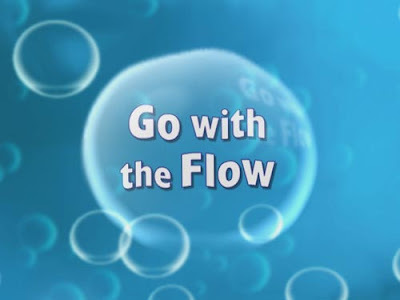 14) almost looks like duben is going to take over the sewage treatment from the city and over to Enwin in that announcement at your site today ... is that a possibility? 15) I haven't emailed you in a long time but I faithfully read your blogs each day. keep up the good work. i'm surprised the Windsor Star isnt gloating over the 13 REAL people who are being laid off. 16) "As Mayor Eddie Francis briefed reporters Tuesday night on the latest round of shrinking the municipal bureaucracy, some of Windsor's most senior civil servants were getting word from their bosses about whether they still had a job with the corporation." Looked at 23 jobs - CAO, 4 General Managers & 18 Executive Directors. More in coming weeks. Affected people being notified tonight. No packages as result of the cuts tonight. 17) Once again only one side of the story is presented. What about the huge severance expense? 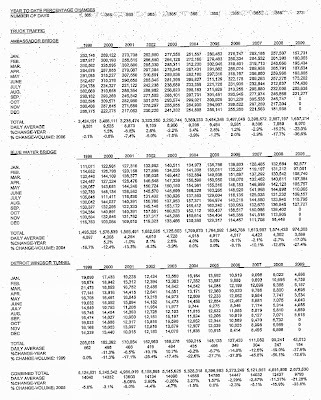 18) "Windsor Auditor General cut today"
Of course he/she wasn't cut as there has never been one. Same thing with the rest of the cuts today. Not one person was cut. No wonder there were "no packages as a result of the cuts." What a sham. Now let's have raises for all the ones left behind because they have so much extra work to do after these cuts! And let's add up all of the savings from the exercise! 19) "paying for what we didn't send them?!" Garbage! Almost sounds like the Saudi's last week thinking that they want to charge the U.S. for the oil they, the U.S. ain't using because what's left of the economy is fast tracked for the landfill. 20) What kind of blueprints do you need to make the tunnel a one time only car wash? He isn't seeing or thinking the obvious! As simple as the drive-thru at MacDonalds! 21) I just read your latest blog about a new radio station. I can hardly wait to reprogram my dial! Firing Melanie was a huge mistake! Let the airwave games begin! 24) at least Eddy and council know that we will not tolerate his actions and we will stand up to him no matter what.I would say that the feelings were a little hostile at times as many of us are still very angry. The only thing that I'm afraid of is that HE AND HELGA are planning the next strike at this very moment. I'd still like the taxpayers to know how much it cost them for this strike. The figures in the paper are totally out of wack. 25) Moroun has been silent of late but I bet a dozen of crack eggs he knows what Granholm said! Keep on crackin' from your end Ed! One of these days we will get to the chickens and have ourselves a roast! 26) (NOTE, this email was sent the day after the CUPE OLRB hearing] I was scouring the paper today and yep, once again Ed...absolutely NOTHING....but seriously does it surprise you? 27) No Windsor Star article....no surprise there..
28) [RE CUPE meeting] The mover of the motion had the last word, and summed it up perfectly for me: "I'd rather lose fighting". 29) Just wanted to let you know that your latest articles were being passed around at the [CUPE] meeting last night by some members. community rests with this complaint given that we cannot recall the mayor. He asks that we all continue to blindly follow him into hell. 31) Good blog. Just to let you know I will be there on Thursday night. I will be voting yes to go forward with this. Edgar needs to be held accountable for his actions. 32) I remember my dear departed Dad telling me a story about when he worked at Singers Sewing Machine Plant (during WWII they made war machines). Anyway, there was a worker who never missed a day of work and was always on time. His reward was, believe it or not, an alarm clock. I remember laughing for ages. My point is……. The City of Windsor has the same management mentality from fifty years ago. posted by JoeBlog at 10:45 a.m. I have made this argument before but, clearly, Prime Minister Stephen Harper's advisors and the Bureaucrats leading the anti-Bridge Company charge do not want the PM to read my remarks. They would prefer that the PM live in Delusionville as they keep insulting the US Government. Oh I know that Canada, and their P3 friends, are so graciously prepared to take over the border crossing problems to make life easy for their American counterparts. Just let Canada run everything here and in Sarnia/Port Huron and Buffalo/Fort Erie too. Throw in the Tunnel for good measure as well. I guess the Dubai ports fiasco has not made its way to Ottawa yet. Or they have not yet figured out that the PM has been snubbed, twice, by President Obama. Or is someone itching for another softwood lumber fight. It's too bad that the PM will never know about the tough shots being faced by and taken by DRIC in Michigan these days. Never mind the comments being made by Senior Legislators in the State about the Bridge Company project being the #1 priority or DRIC being a boondoggle. The economic reality has finally hit home to many American decision-makers who can now appreciate that the Bridge Company is prepared to spend their money on the crossing to improve traffic flow, the real concern, and take the business risks unlike the bottomless pit for taxpayer money that DRIC represents. With Michigan's economy in the dumps, I have never understood why their Legislators would not want to receive the billions in Federal matching grants that could be used for other projects in the State, projects that the State might not be able to afford. Though lawmakers in Lansing have staved off a budget crisis this year using stimulus funding and spending cuts, falling revenue portends a fresh challenge for the 2011 fiscal year, said Michigan State Treasurer Robert Kleine during a speech at the Michigan Tax Conference on Tuesday. Based on the 2010 budget signed by Gov. Jennifer Granholm on Friday, the state treasury has predicted a deficit of $719.3 million for the general fund the following year, according to data presented by Kleine at the conference. “We’ve never really experienced cuts of this magnitude any time in Michigan’s history, and I think the full impact is yet to be felt,” he added. Michigan agencies are being told they could see up to a 20 percent cut in the next budget year on top of the 10 percent cut they took this year. Liz Boyd, Gov. Jennifer Granholm's spokeswoman, said Tuesday that departments are being asked "to put together plans that reflect a 20 percent reduction." Michigan has seen revenues drop in the tight economy, and will have little federal stimulus money left to use in the budget year that begins next Oct. 1." "Critics say the lawsuit is a desperate ploy by Moroun and charge that the organizations in the lawsuit are pawns that have taken his money or are little more than fronts created to join his DRIC opposition." "MDOT continues to review the letter, which it received Friday, and hasn’t decided how or if it will respond, he said. A new open letter to Gov. Jennifer Granholm and the Michigan Legislature from Michigan and Canadian environmental and transportation activist groups calls for the state to halt all spending on a proposed new Detroit River crossing. Citing state budget and environmental concerns, nine organizations — notably Michigan Environmental Council, Sierra Club Michigan and Ontario chapters, Detroit-based Transportation Riders United and the Michigan Association of Railroad Passengers Inc. — jointly sent the letter opposing the controversial project. Michigan lawmakers are struggling to craft a balanced budget in the face of a $2.8 billion deficit by the Oct. 1 fiscal year. 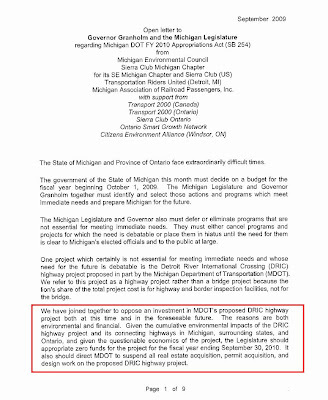 “One project which certainly is not essential for meeting immediate needs and whose need for the future is debatable is the Detroit River International Crossing (DRIC) highway project proposed in part by the Michigan Department of Transportation,” the letter states. The project, which has an estimated $1.8 billion U.S. cost and up to $4 billion overall, is billed by supporters as a needed economic development, trade and security alternative to the Ambassador Bridge and Detroit-Windsor Tunnel. Opponents say it’s an unneeded waste of taxpayer dollars because declining border traffic doesn’t warrant it, and is unfair government competition for the privately owned Ambassador Bridge. In the letter, the groups note that the Blue Water Bridge linking Port Huron and Point Edward is underused and is a viable alternative to another span in Detroit. The DRIC bridge would connect Detroit’s industrial Delray neighborhood and Windsor’s Brighton Beach area. MDOT continues to review the letter, which it received Friday, and hasn’t decided how or if it will respond, he said. Border traffic statistics have been down sharply since September 2001 and the declines in the auto industry have further fueled a slowdown — enough to draw opposition to DRIC from TRU, said Megan Owens, the transit advocacy organization’s executive director. And for TRU, the lack of “no real consideration for transit alternatives, especially freight rail” equally bolster its opposition to DRIC, Owens said in online comments to Crain’s. The organization mainly lobbies for rail transit. Owens also said opposition to DRIC is in no way an endorsement of the privately funded $1 billion effort to add a second span to the Ambassador Bridge by its owner, Grosse Pointe trucking magnate Manuel “Matty” Moroun. TRU and other groups have similar environmental concerns about that project’s spanning effort, which faces legal and political opposition of its own in Michigan and Canada. Also signing the letter were Citizens Environmental Alliance, Ontario Smart Growth Network and the Ontario and Canadian Transport 2000 groups." Sometimes I have to admit Councillor Jones confuses me. The city remains the owner of prime property at Riverside Drive West and Bruce Avenue more than three years after it struck an agreement to give the land to London investor Shmuel Farhi as part of the WFCU land deal, according to land registry documents. Ron Jones, councillor for Ward 2 where the Farhi property is located, said...he is also weary of the site's fate remaining unknown. "Certainly it's prime property. I'd like some indication what the plans are for that property," Jones said. "People ask me about it and I don't have answers for them." Farhi said he believes he is under no obligation to present anything to the city in terms of plans for the site." "The vacant houses are now an eyesore and a hazard, says Jones, and he'd like them torn down, too. But, he said, "I can't do it in good conscience without a plan. I want to know if what they're doing has the best interests of Windsor." He wants a public forum for the bridge to present its plan for the site and for residents to ask questions." "The people have been inconvenienced in those neighbourhoods with the homes being boarded up. It's a safety issue. It's an eyesore. Property values have dropped," said Jones. "I'm not being hard-nosed. I'm not being hard to get along with. I want to co-operate with the bridge company, I want to co-operate with the residents who live in that area." Jones said he would even ask council to waive rules so bridge officials could make a detailed presentation of their plans..."
To me anyway, he seemed much more strict towards what the Bridge Company must do. He wants detailed plans from them even though in other demolition cases "the grass did cut it." In fact, some house demolition Agenda Items even went "On Consent" with no Council discussion at all. All he wanted from Mr. Farhi was an "indication" yet he will not accept what the Bridge Company has specifically told him that they would do with the properties. Is this a big change in attitude by him? "Now Councillor Jones was even more definitive. If the Bridge Company complied with his FIVE-POINT Plan, he would not object to the demolishing of the homes. The only problem, he did not tell anyone what those 5 points were at the meeting! It has to be a huge secret that somehow the Bridge Company must guess or they are out of luck! It must be so bad that he was embarrassed to tell what the points were to the residents at the meeting. Perhaps he was concerned that he night get booed the way the Mayor was at the East End Arena! It was the first time I ever saw Ward 2 people angry at the Councillor. They were incensed when he mentioned his condition at the meeting. They had no interest in Council process or his PLAN. They just wanted the homes demolished." The residents should be so pleased that the Councillor is so concerned about them and wants those houses torn down "with all heart." Or does he? Could he he just worried about the political heat he is taking over supposedly being one of the people preventing the homes from being torn down? Again, you decide. What bothers me though is the seeming caveat about "procedures" at the 1:12 and 2:04 minute marks. He also talked about the ways of overturning a by-law at 1:35 but put the responsibility on other Councillors to act, not himself. Why should they do something and not the Councillor or his Wardmate Councillor Postma since the homes are in their Ward after all? I assume that there are several ways of doing so WITHOUT the Reconsideration that he mentioned. Why doesn't he show the courage he talked about? I trust now you understand my state of confusion. Hot off the press. Stories to shock and amaze you and to make you cringe! The original cost projection was $6M not very long ago. The Feds balked at first since they only had set aside only $2.9M for the project but must have knuckled after August this year when the cost was "just over $8M." Now it is $8.9M and counting. About a 50% overrun. That is even worse than other City projects around here. "It may end up as a road to nowhere, but the $1.6-billion Windsor-Essex Parkway is going to be a reality -- and very soon, the president and CEO of Infrastructure Ontario said Thursday. Whether a new international bridge in Brighton Beach ever gets built or even if Michigan backs out of the proposed $5-billion border infrastructure effort, construction will start "almost immediately" in Windsor on a new border highway in the Talbot Road-Huron Church Road corridor, said David Livingston. "The road is going ahead," he said." "While $1.6 billion has been touted for months by DRIC and politicians as a projected cost for the parkway, that number should be thrown out the window, Livingston said. "We don't give (bidders) a budget," he said. "We give specifications of what we want to have built. They design to those specifications and put a price on design. "Our answer is 'it's going to be, what it's going to be.' We rely on the competitive process to get the best numbers. The presumption is they will fight with each other to come up with the lowest price." I cannot understand the reason for spending one penny of this $9M of taxpayer money to help out a private operator (Hmmm isn't this anti-competitive and discrimination against the Bridge Company). There will be no need for this ferry service if the DRIC Bridge is built in 2015 or later since it will be allowed to carry hazardous loads. Oh, I got it. It's really a signal. We are now being told, subtly of course, that there will be no DRIC bridge after all. Therefore, we still need the ferry service! Classic line from the Wizard of Oz that now can be applied to Macquarie's toll road projects. You remember Macquarie the ex-operator of the Tunnel who are now short-listed as part of a group to build the DRIC road. The same Macquarie who could not raise money for the Port Mann Bridge! For Macquarie Capital, the gravy train associated with Macquarie Infrastructure Group will keep flowing even after it separates into two companies. But the fees being paid to Macquarie to continue managing Active (Bad) MIG are actually proportionately higher than under the previous structure"
Can you imagine if Macquarie had the nerve to say now that it wanted to finance the DRIC bridge and plazas in both countries. Naw, no one would be that bold. "UBS analyst Scott Kelly thinks Good MIG, which will own only the 407 toll road in Canada and the Westlink M7 could be a potential takeover target, in the footsteps of an earlier spin-off, Sydney Roads Group. But if that’s true, the Ontario Teachers Pension Plan Board – once considered a potential buyer – would now appear unlikely to make a move, since it sold its 10 per cent stake in MIG a week before the split was announced." However, Michael Nobrega wants to be heavily invested in infrastructure. Do I get a finder's fee for bringing this concept to his attention? Clad in a black miner's jacket and sky blue hard hat, Detroit Archbishop Allen H. Vigneron descended 1,200 feet and 400 million years into the salt of the earth. The archbishop blessed a newly crafted statue and shrine to St. Barbara, the patroness of miners, at the base of the hoist -- the only portal in or out --- at the Detroit Salt Co. on the city's southwest side, Michigan's lone rock-salt mine. HOW DO WE KNOW THAT "NO" MEANS "NO"
"In Windsor for the 2009 Ontario Liberal Party annual general meeting, McGuinty was clear when asked if any chance remains to fine tune the new border access route, budgeted at $1.6 billion, and billed as the most expensive roadway in the history of the province. “We have now nailed down the final plan,” McGuinty told reporters, after visiting St. Clair College to talk with second-career students, many of whom are training in the construction trades that will help build the massive infrastructure project. “It’s now incumbent on all of us to move ahead with that. We will know the battle is over when the Greenlink banner at Council Chambers comes floating down just like the banners for the losers on the ABDC TV Dance show. "McGuinty also dismissed concerns that Michigan seems less-than-eager to start the project, given state lawmakers have yet to official green light even the acquisition of land, something they won’t vote on till 2010. Windsor MPP and Ontario finance minister Dwight Duncan — standing beside the premier along with Essex MPP Bruce Crozier — also weighed in on the issue, suggesting that vocal DRIC critic Michigan Senator Alan Cropsey is wrong to suggest the project will be voted down in Michigan. Oh Dalton, President Obama after NAFTA-gate and the high-ranking Congressional leaders have no interest in building a DRIC bridge. The PM hardly received any face-time with the President in two meetings, at the Three Amigos conference and in DC. I am afraid that Senator Cropsey has a better feel for Michigan politics and what the Governor and House leader think than our Minister of Finance. Speaking of signed agreements, Dwight has obviously never been shown several key ones or he would not have said what he did. Poor Dwight, it will be so embarrassing for him. First the "untendered, $81-million contract for an energy centre built to power a casino in Windsor" and then if the Opposition ever wakes up, the huge MegaProject run amuk known as the DRIC Road. No, as we shall hear soon enough. Perhaps Edgar will sue and stall things off to save face for everyone too. The Ontario government had its credit rating downgraded one category by Standard and Poor's Ratings Services on Thursday in response to its recent projection for a record deficit and negative prospects for the province's economy going forward. The province's rating was dropped to AA-minus from AA. "The downgrade reflects our view of the sharp deterioration in Ontario's current and projected fiscal performances announced recently in the government's second-quarter fiscal update," Standard & Poor's credit analyst Stephen Ogilvie said in a statement. Last week the Ontario government said it expects to run a deficit of $24.7 billion in the current fiscal year, up from its expectation of $14.1 billion in March." What's with the Star these days! How is anyone in Windsor supposed to know what to think unless Star columnists tell us. And that has become very difficult. Did they take seriously the mini-Gord Says/Anne Says debate concept they had when they were first appointed? Where each was supposed to take one side of an argument. Or, is this all a set-up for Gord to have the last word by demolishing any anti-Edgar (aka Eddie) positions to re-affirm the genius of our Mayor. "Jury is out on city shakeup"
"Streamlining the city's 'unwieldly workforce'"
"Perlin looks at his time in Windsor with some frustration because he was unable to complete his vision for change. His controversial restructuring of personnel, which involved the shuffling of nearly every city department, was merely a first step, with governance policy and service delivery changes in Windsor next on his to-do list. But “(Francis) didn’t agree with the model put forward when he became mayor,” Perlin said. “What we had formed had a whole lot of staff and teams excited about how we were to change delivering services,” Perlin said. “We never got to that part. Windsor would have been better off to continue with that process.”"
How many years, how much more money in running an ineffective City Hall was wasted in not doing what should have been done an eternity ago because Edgar did not agree. Instead, we got his multi-multi-year SDR exercise that should take us to the next election. "There were 17 names on one list of targets when the city reorganized its executive ranks in 2004." So assuming salary and benefits per manager at say $125,000, Edgar has wasted, over 5years of inaction, $10,625,000. Now THAT would have paid a lot of Post Retirement Benefits!" We need a starting point, a place to know where we are so that we can judge how well we do when we look at results. We will conduct in-depth audits of all of our departments to assess where we stand, and to identify inefficiencies and implement sound management principles across the corporation. It’s inconceivable that an entity of one half billion dollars can’t be run more efficiently. Estimated savings will amount to $10 million per year. 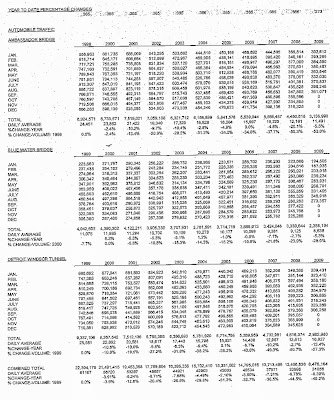 Based on the success of other municipalities using Citistat annual savings growth increases over time." I honestly cannot believe that no one has called Edgar on Citistat. That was how he beat Bill Marra by a whisker and yet he has not implemented any of it. Why was he afraid not to do so? I have never understood that. It's Novemeber already and Council is now just finding out what our year-end variances position will look like. Little can be done now. Sure blame it on the strike, not fiscal irresponsibility in running a half billion dollar corporation this way. Or lack of Citistat. Where is that money-guy, the Councillor formerly known as Councillor Budget who should be worrying about things like this. No wonder he is afraid to debate Junior publicly or to appear on Face-to-face. He would be crucified! A realignment and downsizing of Windsor’s top city brass, as well as the elimination of 12 fire department positions and a fire truck, is expected to yield almost $2 million in annual tax savings, Mayor Eddie Francis announced Wednesday morning." At a closed-door meeting Monday night, city council approved a plan that eliminates 12 fire department positions, including four captains and five firefighters, and gets rid of an aerial ladder truck that had been deployed at station No. 3 at 2570 Ouellette Ave. It also reduces the daily complement of firefighters and officers on duty to 53 from the current 57." "As for the fire staffing cuts there are no layoffs. The Department is merely not replacing people who retire. The truck in question has been out of service over one third of this year and last year when staffing levels through absenteeism were not sufficient to place it in service. This cut has been identified by a consultant and the Chief, Dave Fields. The Chief offered the cut and was not under pressure to offer it." Firefighters are raising alarm bells, saying they're concerned about public safety after the fire chief's decision to temporarily idle a fire truck. Fields said he was instructed by council to cut overtime costs, and it's up to him to decide how to do that. Safety hasn't been compromised, he said. "I understand the firefighters won't like this," he said." city staffers should take a deep breath and relax just a bit. The vast majority of them will keep their jobs. Helga Reidel, the newly appointed chief administrative officer who has been handed this huge task, said attrition is the main tool she intends to use to cut costs. She used the "A" word a dozen times Wednesday. It means letting normal retirements reduce staffing gradually, painlessly. "We also have a significant number of vacancies" throughout the organization, "and right now that's a good thing." Empty jobs are being eliminated, permanently. Reidel (a very smart, upbeat, decent soul, if you haven't met her) has ordered department heads to look for no-layoff savings, no-layoff consolidations, no-layoff outsourcings. People can be moved to new positions if their jobs are eliminated. Council will pay a few executive buyouts, but the city can't afford Big Three-style wholesale buyouts. It doesn't need them, anyway. The magic of boomer demographics means Windsor will get the savings it needs simply by having a reorg plan in hand while hundreds of staff start collecting pensions. In passing, mini-Gord just HAS to learn how to keep his mouth SHUT! He just demonstrated completely that there was NO NEED WHATSOEVER for the 101-day strike since the issue of PRBs for new hires was a phony one if there are going to be NO NEW HIRES! He just confirmed CUPE's bad faith OLRB complaint! Before, he said, "we didn't know what we were doing." Frankly, that's a startling statement. Where has everyone been? Attempts to restructure have been going on for a decade. Another general manager is moving to a vacancy in Enwin Utilities Ltd. -- which is owned by the city. Part of his job will be consolidating water and sewage services. But Enwin's business is electricity. The Windsor Utilities Commission, also part of the city, handles water, and the city's sewage plants deal with sewage. So is this an accounting manoeuvre? The executive director position that was cut has been vacant for two years, since the head of sewage treatment left. Is this smoke and mirrors? But I can't help noticing similarities between the two exercises. Perlin's restructuring was launched for the same reasons: a looming financial crisis, the belief that the city couldn't continue raising taxes, the need to change the way the city operates. I have questions when I look at the new, seemingly overflowing and mismatched portfolios. "Forget about Halloween. That's child's play. The really scary stuff is happening right next door in economically haunted Michigan where communities with their backs to the wall are using chainsaw tactics to slash civic payrolls. In Detroit and its hostile suburbs, from upscale Troy to downtrodden Pontiac, desperate communities are dumping cops and firefighters, issuing pink slips to teachers, eviscerating contracts and hacking at services." It seems only fitting that this exercise will unfold in the month of the dead, the darkest and dreariest time of the year, because there won't be much joy in seeing people's lives turned upside down and long-established work patterns forever altered. But as blood lettings go, this won't compare with the gore being splattered across the river. Instead of an axe, the instrument of choice is a scalpel. And instead of lopping off heads, the aim is to save the patient, however late in the game, through aggressive surgical intervention." Not one real, live firefighter will lose his or her job." They still do not have guts but for the Messenger's pretending they are doing something bold. Heck, Edgar needs an election issue and what can be better than knocking CUPE since there is no money for mind's eye visions like the canal. If Junior's Strike Report says what he claims, we will understand how this City has truly been mismanged for 2 Mayoral terms and how it will impact us in the future. "be pro-active," said Francis and prevent a lot of pain and suffering later on." hundreds of thousands of dollars have been wasted in legal fees in fighting the formation of a "managers' union" since managers who formed the Professional Employees Trade Union became " so disenchanted over job security, quality of life and work demands they voted to unionize." firefighters have been without a contract for 3 years and are now in arbitration. Thanks to Councillor Halberstadt's BLOG, we saw that garbage workers were able to negotiate improvements in operations so why is outsourcing being brought up except as an anti-CUPE tool. What can we now conclude after seeing so-called supporters deserting him. 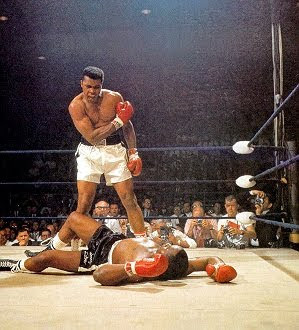 It's more than a TKO. Edgar is actually down for the count! If only Premier McGuinty had not lengthened Council's term by a year. We could have been rid of Edgar this month. [Sigh]. That seeming $10M discrepancy I mentioned between the amount claimed that the City would save during the CUPE strike--$30M--and the actual savings--$20M--is just too big to ignore. Something is very suspicious here that needs checking out. I need to find a skilled auditor who understands municipal bookkeeping who can help me out at a cost that I can afford. Or perhaps CUPE can retain one for the fun of it. Mayor Eddie Francis said Monday Windsorites will get back any dollars saved by the city during the strike by municipal workers. "The city does not need the money and we do not need a strike to save money," Francis said. "Our proposal would be to return those dollars to each household." It's been estimated the city is saving about $300,000 per day on payroll costs during the strike by 1,800 inside and outside workers that started just under two weeks ago. The mayor's comments came in response to accusations by CUPE Ontario president Sid Ryan that the city was using the strike to save dollars and balance the 2009 budget. Whenever the strike ends, city administrators will determine the payroll savings, subtract the city's management overtime and other strike-related costs and give back the rest to homeowners, the mayor said. "We are not going to use this money to fill a hole in the budget," Francis said. "There will be an independent and side account. Any net dollars will not go to the 2009 budget or our reserves, but back to ratepayers as a rebate..."
When asked how residents can be assured what the city saves during the strike is accurately reflected at the end, Francis responded: "There will be a full accounting. If you want to come in and audit it, you are more than welcome." By the way, I have not seen that "independent and side account." Have you? "There's a Christmas cheque in the mail from the city -- every ratepayer, from smallest homeowner to Casino Windsor and Chrysler HQ, will be getting $72 mailed to them courtesy of city council. "This avoids the stereotype that politicians don't follow through with what they promise," Coun. Drew Dilkens said following the Monday night vote." Francis said council owed the money to ratepayers now"
"But don't hold your breath. Mayor Eddie Francis isn't about to backtrack on the commitment he made early in the strike that city residents would be reimbursed from any savings accrued during the work stoppage. "People are hurting. People need the money. It's a significant amount of money that could pay a bill. It's a simple concept. If we're not using this (tax) money, we should be giving it back to the residents," insisted Francis." "Yeah. It's a missed opportunity. I can't argue that the dollars wouldn't be better spent on a project. But that would wreak havoc," Brister warned. The problem, he said, is that it's now built into people's mindsets that they're going to see the money and all hell would break loose if the city fails to deliver on that commitment. "It's late in the game. A promise was made. And now it's a credibility issue and we've got to do it," he explained. "That train has left the station." 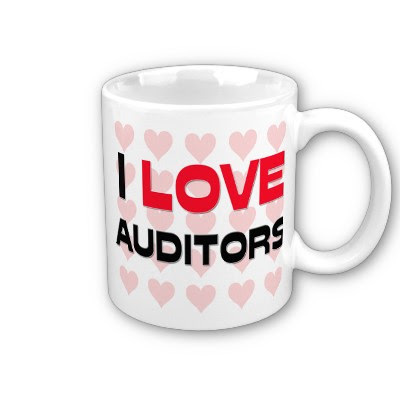 Now whom can I use to do that audit? One of the major accounting firms could be used other than those used by the City or another municipality so that could cut down the possibilities. There are some specialized forensic accounting firms who could do this type of work. Regardless of which firm was used, I bet we are talking fees in the 6 figure range. And the firm would have to understand municipal books. Frankly, for a $72 rebate cheque that is a big sum for me to pay unless I can find thousands of other Windsorites who would send me their rebate cheques to help pay for the fee. Silly me. I got it! The answer has been staring me in the face all the way along. There is only ONE person who is perfect for the job and he would have a personal interest in being retained by me. He would understand how to do a forensic audit because he has done that kind of work before. He would understand City books given his background. He would know to whom he should speak at Finance Dept. based on his expertise. No one could pull the wool over his eyes even though they have tried in the past. Of course he is good. He has been smeared! They are terrified of him and what he could expose. Sure his work for me might be “disjointed” and some of the conclusions Might "not supportable.” But can you imagine, "I guarantee if [I] release that report it will create more brouhaha than you ever want to see."